Have you ever wanted to face plant in a salad? I mean, it’s probably much more likely you want to face plant into an ice cream sundae or chocolate buttercream frosted layer cake. But I just made a salad I want to face plant in. Almost more than cake (but that could also be because I ate a brownie for breakfast and am on sugar overload). 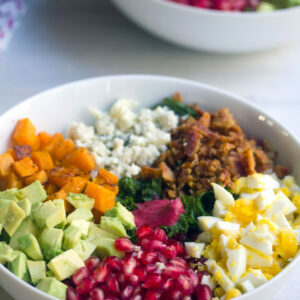 I know that Cobb salads aren’t exactly known for being healthy… Not even necessarily because they’re super unhealthy, but more because they include lots of indulgences and don’t usually offer a whole lot of nutritional value. But to me, the key with salads is to balance out the extreme healthy with a little indulgence. It’s not likely I’ll ever be fully satisfied with an all veggie, no fun dressing, no croutons/cheese/etc. salad. But I also never want to take a healthy salad and cover it in fatty dressing, and load it with all the carbs, lots of unhealthy fats, and no nutritional value. I think this salad is a pretty fabulous balance, if I do say so myself. Plus, you can obviously alter the measurements to your preferences. Convinced now that all bacon is evil? Replace it with chicken or ham. Hate everything about hardboiled eggs (um, we can’t be friends anymore)? Leave them out. I also made a cranberry dressing that’s definitely on the tart side, but heavenly when massaged into the kale and drizzled over the top of the salad. I told you I’d be cramming cranberries (say that 10 times fast!) into everything I make this fall/winter and I’m not kidding. Both the savory and sweet! So, what exactly do we have in this delightful mix? I used kale as the greens, which makes way more of a nutritional impact than romaine or iceberg lettuce. I also added in butternut squash, pomegranate arils, avocado and hardboiled eggs. And some extra indulgences like crumbled bacon and gorgonzola. There is no way on Earth for me to decide what my favorite part of this salad is. I love every single bit of it. But I do have to give a shoutout to butternut squash and pomegranate being back in my life. Of course, kale is a cool-weather vegetable, too, but I can be found eating that year-round. Now can you see why I want to face plant in it? I really want to do an experiment to see how many days in a row I can eat this salad before I never want to see it again. I think I could get through all of fall and winter. After Thanksgiving, I might consider replacing the bacon with leftover turkey. And maybe eating with a side of stuffing… because stuffing is another food I could face plant into every day for the rest of my life. But otherwise, I’d keep this exactly as it is. Would you face plant into this salad? Or at least sit down and happily eat it with a fork? I mean, I guess that cranberry dressing could get a little messy in your hair. I’m filing this one under one more reason to love fall! 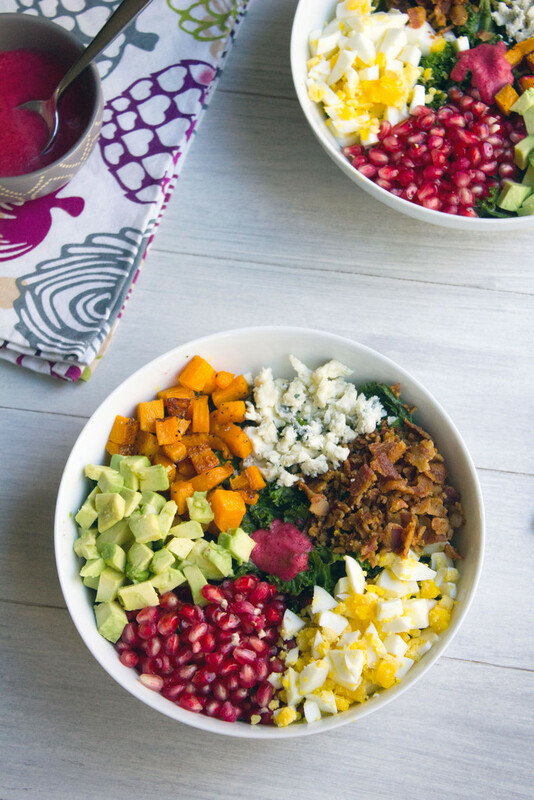 This fall salad is the perfect balance of healthy and indulgence. 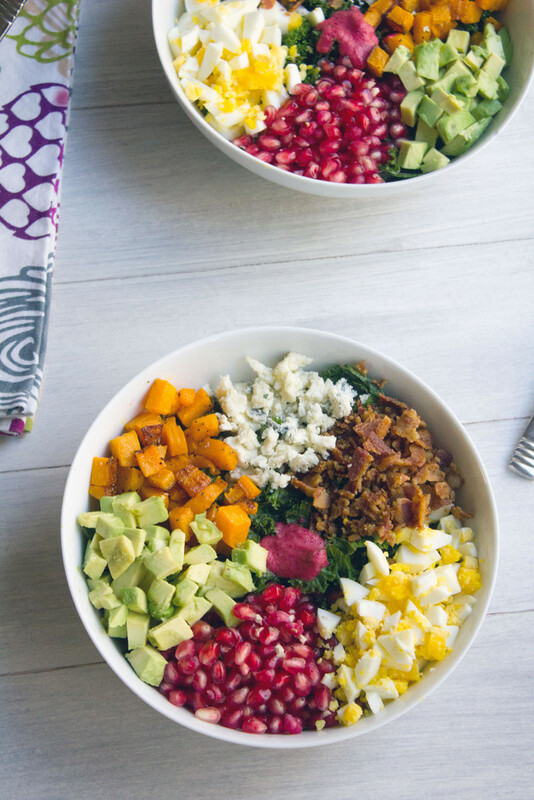 With kale, butternut squash, hardboiled egg, pomegranate, avocado, gorgonzola cheese, bacon, and cranberry dressing, you'll crave this salad all fall long. Toss butternut squash cubes with olive oil, salt, and pepper on a foil-lined baking sheet. Bake squash for about 25 minutes, until tender and starting to brown. Remove from oven and let cool. 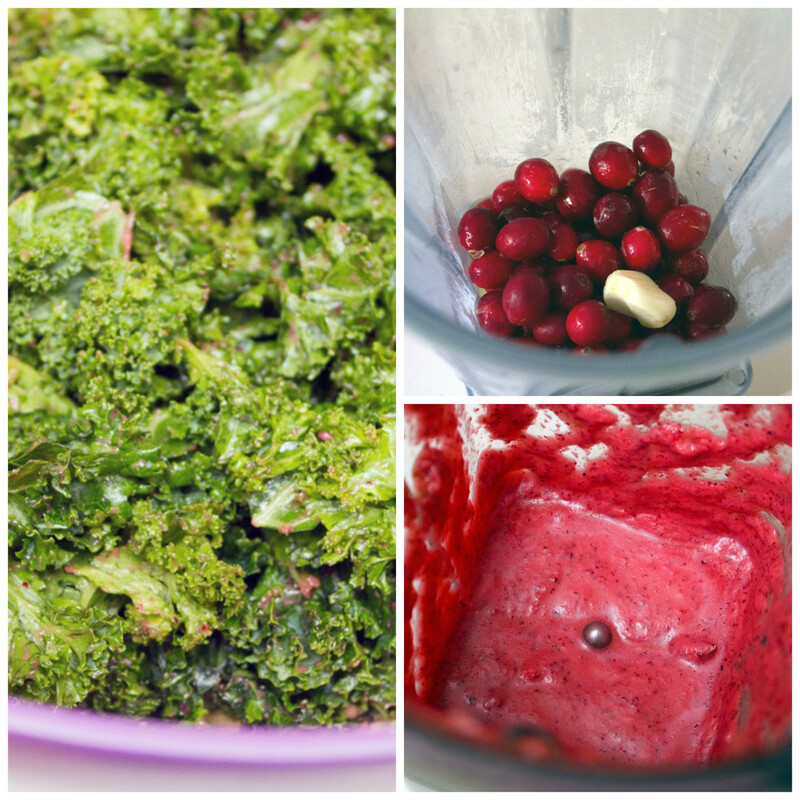 In a large bowl, pour cranberry dressing over kale. Gently massage dressing into kale for a couple minutes. Evenly divide kale into two smaller bowls. 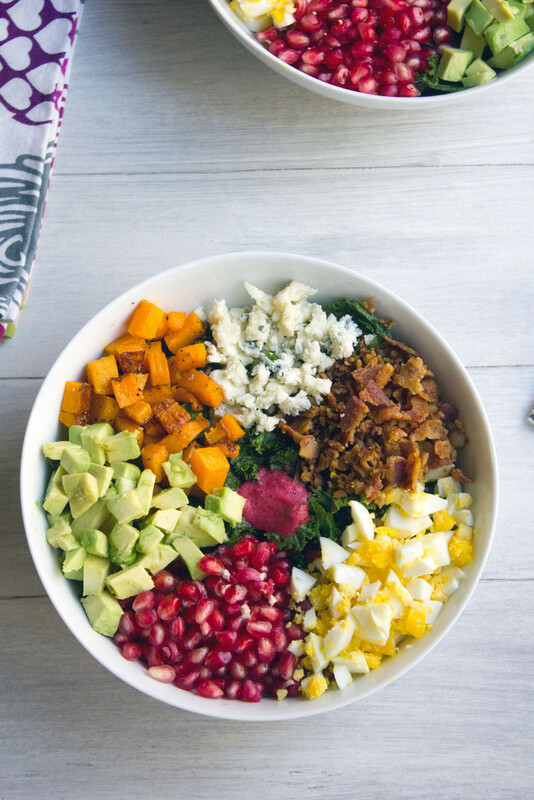 Divide chopped hardboiled egg, pomegranate arils, diced avocado, crumbled gorgonzola, and crumbled bacon on top of kale in two bowls. Drizzle additional cranberry dressing on salad if desired. Put cranberries, orange juice, lime juice, red wine vinegar, and honey in a blender and blend until smooth. Slowly pour extra-virgin olive oil in and process until well blended. 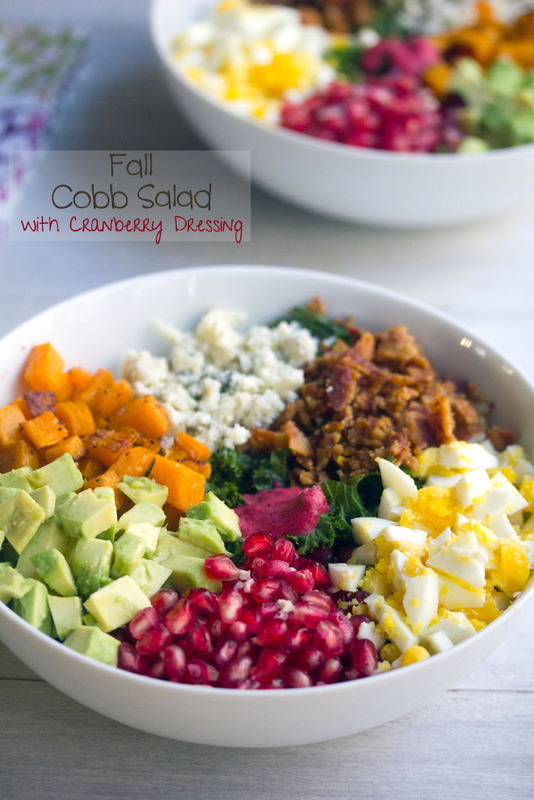 16 Responses to "Fall Cobb Salad with Cranberry Dressing"
what a wonderful salad! mmmm! this looks absolutely gorgeous! cannot wait to try it! This looks so perfect! I love that cranberry dressing…yum :). Can’t wait to try it! This is my kind of salad. 🙂 I love that it has plenty of fun ingredients! And I’m so about your suggestion of replacing the bacon with leftover turkey post-Thanksgiving. I love the variety of fruits and vegetables all gathered up in one bowl! It looks beautiful as well! 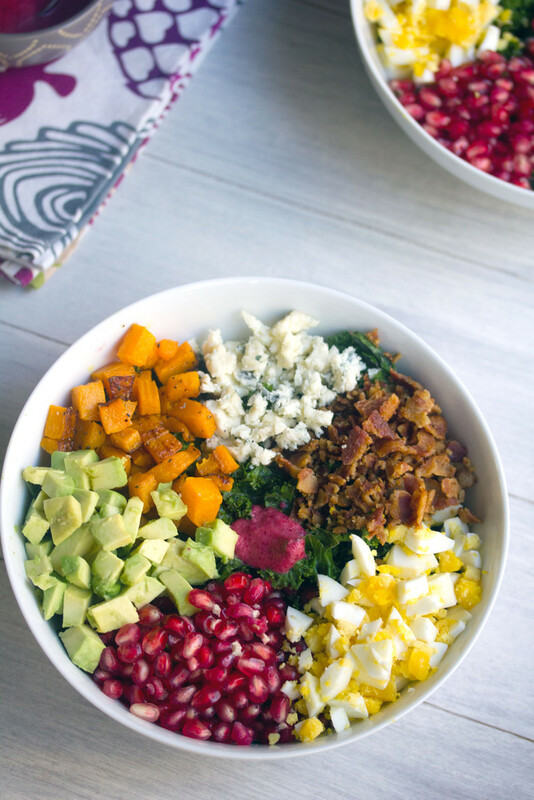 The colors of this salad are stunning! It’s like a rainbow of health. Gorgeous salad! I, too, love salads with a great balance of nutrition and indulgence. I find them much more satisfying than the all-veggie versions! I am LOVING this salad! Every ingredient makes me happy. Ooh! This is just the prettiest. Love pomegranate seeds with avocado. I’ve only had the two together in guacamole, but a salad is great too. Very bright colors and flavors! GORGEOUS! I love that pom seeds are popping up everywhere. I haven’t seen them in a cobb salad yet though. Can’t wait to try this one for lunch! This salad looks so good and that cranberry dressing looks totally yum!! This looks wonderful! I love all the flavors and colors.